By Tom Robertson Shared Vision member Michael Meuers came up with the idea of asking businesses to post signs in Ojibwe. Meuers' goal was to get 20 businesses signed on to the idea in the first year. But in just six weeks, nearly 60 businesses are on board. That includes big organizations like Bemidji State University, the City of Bemidji and the local hospital. It also includes smaller organizations like Harmony Foods, a downtown health food cooperative that will soon produce Ojibwe labels for the fruits and vegetables in its produce section. 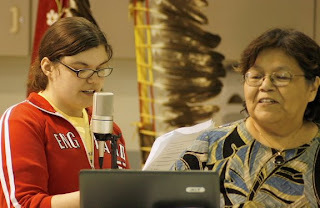 Meuers works with local Ojibwe language experts to help businesses with proper usage and spelling of Ojibwe words. He said a local funeral home has asked for an Ojibwe translation for a blessing for grieving families. Other businesses have asked for translation help for words like "pharmacist" and "we fix computers." The Shared Vision group is working on strategies for tackling a wide range of complex race issues. But Meuers said the Ojibwe signs are a simple gesture, and the first tangible sign of progress. "It's profound in its simplicity, and it's inexpensive to do," Meuers said. "The thought occurred to me that Indian people would look at this as a welcoming and a sign of respect. The non-Indians in the community would learn a little bit about the indigenous peoples that have been here for thousands of years, and the tourists would love it, so there's an economic side of it, too."